For the past week, everywhere I have gone, friends and colleagues have been asking me what I think of the Disney Lucasfilms deal (aka the Disney Star Wars deal). Although it's a huge surprise to the general public, the entertainment industry might not think so; there has been a long-standing relationship between the two companies (been on a Star Wars ride at Disney? there you go). In the pro column is the reboot. (What?!) Oh, don't worry. I'm a fangirl. (You did notice the Star Wars section on the blog, right?) I know that the first three movies (let's be clear, Ep 4-6) are epic for their insane production techniques, their massive scale and the undying legacy. I get that. I feel that. I love that. Fans of the original movies are fans for life. Star Wars is everywhere you look today, as much as when it first came out. It is a force to be reckoned with (hehe) in terms of marketing, product development and licensing. Star Wars prints money. Daily. But I am also a mom. We initiated the Dude to Star Wars by showing him podraces when he was a toddler. Just the podrace sequence in Episode 1. That was about the length of his attention span. He seemed taken by the idea of a little boy flying a ship and fighting bad guys. There were speed, explosions and loud noises; how could he not love it? He was in paradise. In fact, he quickly started asking, "I see podrace? I see podrace?" Hooked. Right from the get-go. So, if it is to survive, if we are to pass the magic of Star Wars on to the next generation, movies produced with new technologies and better graphics are probably going to be instrumental. Just think about how advanced the original series appeared to be, back when we were kids; they were incredible for the time. And right now, the CGI-heavy episodes 1-3 seem(ed) pretty darn good. But imagine just how quaint they will seem in 5-10 years, or even better in 20-25 years when our kids are having kids. No, unless we want Star Wars to become a relic over time, we need to consistently breathe a little life into it via spin-offs, remakes and new stories. Which brings me to the other part of my thinking: Is it necessary? Has Star Wars not been through enough? Have we not tortured the Jar-Jar out of it already? Is it time to recognize that the more we screw with it, the more it strays from the original, and maybe we should just accept Star Wars for what it is (awesome in its original format, and less so in the latest episodes) and just leave well enough alone? Oh sure, if they generate new episodes, we'll have our tickets bought in advance and the Dude will be thrilled about it. But won't it feel a bit cheap... like we're cheating on those first 3 movies... like the soul has just gone out of it? 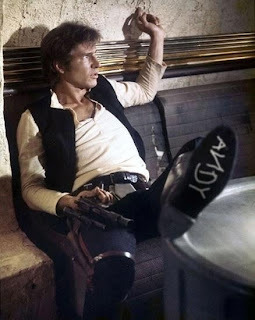 I won't argue that Disney will cheapen the Star Wars name; Star Wars is a brand with a ton of recognition. But a big part of the Disney machine focuses on cross-marketing their product lines. Sure, there might be a Star Wars theme park (or 10) that pop up over the coming years, next to Magic Kingdom and Animal Kingdom. (Star Wars Kingdom?) But what will prevent them from doing a Mickey Mouse take on the story? They've already done A Christmas Carol and Three Musketeers, among others. Who's to say they won't do Star Wars? 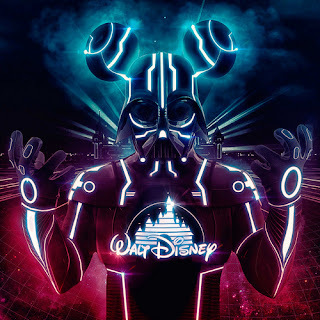 There have been Tron-Darth-Mickey mashups circulating over the past couple of weeks; they're not that far-fetched. No, I think Disney will gladly cheapen the Star Wars image. I have also complained that another awful part about the deal with Disney is their "movie vault" marketing ploy. You've seen the commercials: "Get Beauty and the Beast before it goes into the vault forever!" (which apparently is a 7 year cycle or a major anniversary date, whichever comes first) Can you imagine if they tried to lock away the original series? The last 3 episodes? I mean there are so many bootleg and digital versions, it would just be ridiculous but that's still how they operate in their marketing division. Now while this model is hopefully going to go away as Disney realizes that people don't want to own physical copies, they want access to content, it is still indicative of a traditional approach to marketing that underlines some of Disney's thinking. I would rather remember Star Wars at its prime than watch it disintegrate into a soul-less vapid version of its former self. Though the Disney coffers might continue to fill and future generations might continue to experience some semblance of the Star Wars story, there's a part of me that hopes someone will be brave enough to declare the end of its new life, before it goes so far off the rails that it is no longer recognizable. Granted, we're already close, (maybe already there?) so I'm not all that hopeful. And so I say, RIP Star Wars. I miss you like you're already gone.